Following 5 named storms in late 2017 we have already had Eleanor, Fionn, David and we are now experiencing Georgina’s forceful winds and rain in 2018. The rain we like – it keeps the turbines spinning but the wind has been so destructive. In accordance with Natural England’s preference under our HLS we have left ivy to climb into our trees but the result is as you see in the picture. Given wet ground and high winds the big oak tree covered in ivy could not stand the pressure of the constant battering of the high winds and lost its battle to stay upright. 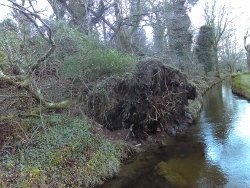 Some of you may remember the old oak tree beside the leat as when we built the hydro electric scheme 23 years ago we deliberately wiggled around this old, old oak tree. Alas NE with the aid of nature has brought her down despite our best efforts to keep her!